All-natural facial serum that helps in calming redness, flushing and bumps. Aids in softening and reducing rough patchy skin, red spots, pustules and enlarged capillaries for clearer, calmer and healthier looking skin. Directions: Shake well. 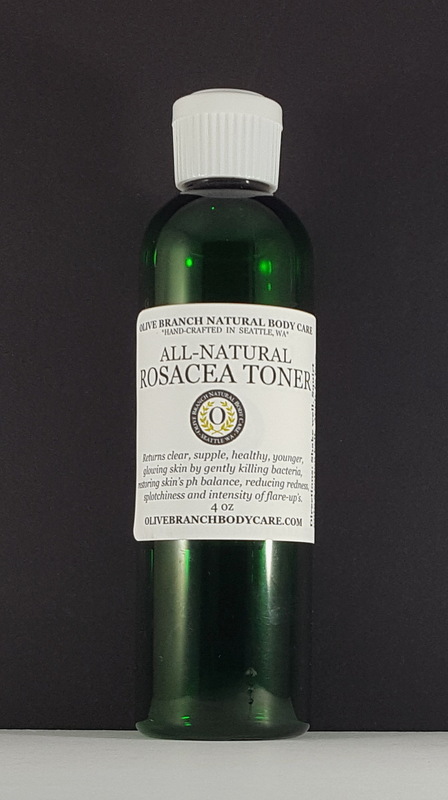 Gently massage onto face, neck and chest after applying the Rosacea Toner. Let absorb in. Follow with our Anti-Aging and Restoring Face Cream both morning and night. Each morning, finish with our Lift, Tighten and Contour Gel, for calmer, brighter and younger looking skin all day. For further reduction of redness, increased clarity and skin brightness mix a very tiny amount (dusting) of the Finely Hand-Ground Natural Vitamin C Powder (skin booster) in the palm of the hand with our Natural Anti-Aging Face Cream every night. Note: Skin with Rosacea should avoid manual exfoliators, scrubs and cleansers with peppermint, menthol, salacylic acid or alcohol and avoid cleansing with washcloths. These can cause inflammation for skin with Rosacea. Also, it is helpful to follow a low histamine fresh food diet. If you use foundation, a mineral-based makeup is recommended because it doesn't penetrate the skin as a liquid foundation does, but simply sits on top of it, and is less likely to result in additional inflammation. "I used your Rosacea recommended products today. They totally calmed my skin. I could cry. It’s been pretty rough and getting worse. 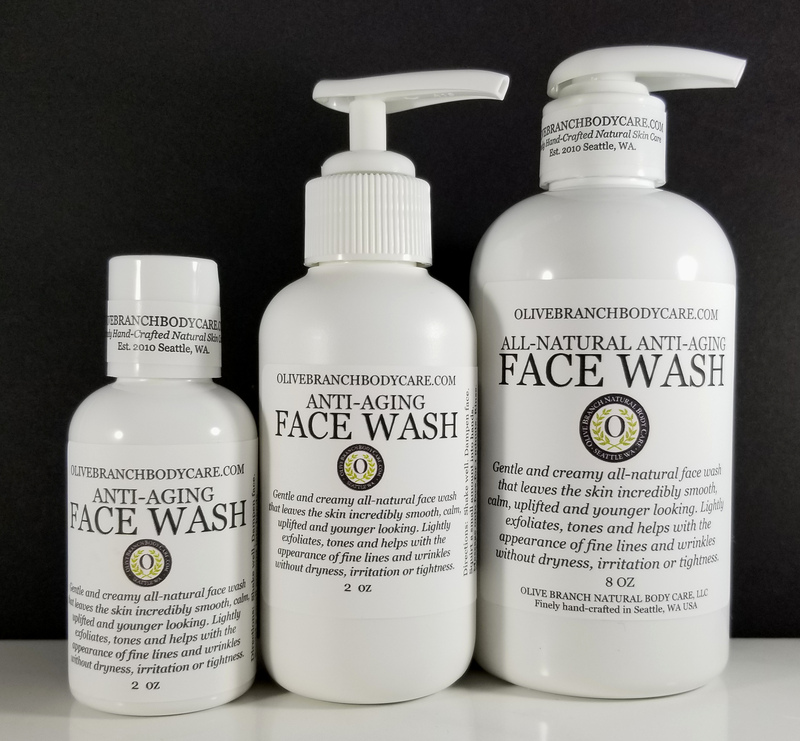 Thank you"
"I bought Anti-Aging Face Wash that is good for Rosacea and Rosacea Toner for my husband who really likes it! He wants to buy the Rosacea Elixer now. He's a true believer- told me his face does not hurt anymore! I am a big fan of your stuff!" Karen - Seattle, WA. "I love my rosacea oil. It has shown to be truly working on my cheeks! So, I got an idea. I have had a sore on my eye lid which has not healed.And it's been over a year! I tried everything. My Dr.said it would go away but it hasn't. I began to put this oil on it as well as on my face 2x a day and it ( the sore) is shrinking and healing. I would rather do this than surgery. Thank you so much for your wonderful healing products ! "Wonderful Products! Just finished my morning shower and applied the Rosacea Face Elixir and Anti-Aging & Restoring Face Lotion w/spf 30 as I have been doing for quite sometime now. I started using these and the Advanced Eye Gel after I had some extensive face surgery for skin cancer - and a very obvious case of rosacea. I am so pleased with the results that I had never been able to get before. Today I am ordering the new rosacea toner. I have used some of the other products and have been really pleased." Organic Jojoba Seed Oil: Is comparable to sebum, a waxy substance secreted by the glands in the body that protect the skin from bacteria and helps it stay supple and soft. Jojoba oil behaves the same way as sebum. In addition to holding in moisture, the oil’s natural antibacterial and anti-inflammatory properties work to kill the organisms contributing to rosacea outbreaks as well as reduce swelling and redness. Jojoba may also boost cell division and growth, which speeds up the healing process and make the outbreak subside faster. Organic Borage Seed Oil: Contains one of the highest levels of GLA (gamma linolenic acid) that soothes dry skin and sensitive skin, as well as for any inflammatory skin conditions. It is regenerative and firming, properties that help restore hydration and elasticity. Evening Primrose Oil: Contains a high concentration of a fatty acid called GLA (gamma-linoleic acid). This fatty acid is largely responsible for the remarkable healing properties of the plant. The gamma-linoleic acid (GLA), linoleic acid and other nutrients in this oil are essential for cell structure and improve the elasticity of the skin. Organic Refined Rose Hip Seed Oil: Refined for it won't irritate the skin (unrefined can irritate sensitive skin or those with skin issues). Known for strengthening broken and damaged capillaries and healing the skin. Good for dry, wrinkled skin. Organic Cucumber Seed Oil: Known to strengthen skin barrier, anti-inflammatory and highly moisturizing. A smooth, soft, delicate and light-weight oil with a dry silky feel, and great for helping reduce the apperance of pore size. Cold pressed from the dried seeds of the cucumber and contains a very high level of Linoleic Acid which is also particularly beneficial for a healthy skin barrier. Also contains an unusually high level of phytosterols. Studies have found that phytosterols in plant oils applied to the skin stimulate collagen formation. Collagen is required for skin structure. As we age this is reduced in our skin causing it to wrinkle and thin. So with increased collagen formation, our skin will become stronger and in better condition, with the added youthful benefits of this anti aging ingredient. With a better skin structure, the tiny capillaries close to the surface of the skin that make us flush or have thread veins are also better supported within the skin and so less prone to damage and surfacing.The exceptionally high level of phytosterols also have a powerful anti-inflammatory action, helping to calm the skin. Lupinus Albus Seed Extract: Extracted from the coatings of sweet white lupin seeds. Anti-aging and firming ingredient that stimulates the synthesis of a high-quality collagen to increase elasticity and firmness in the skin, helping to remodel the facial contour. 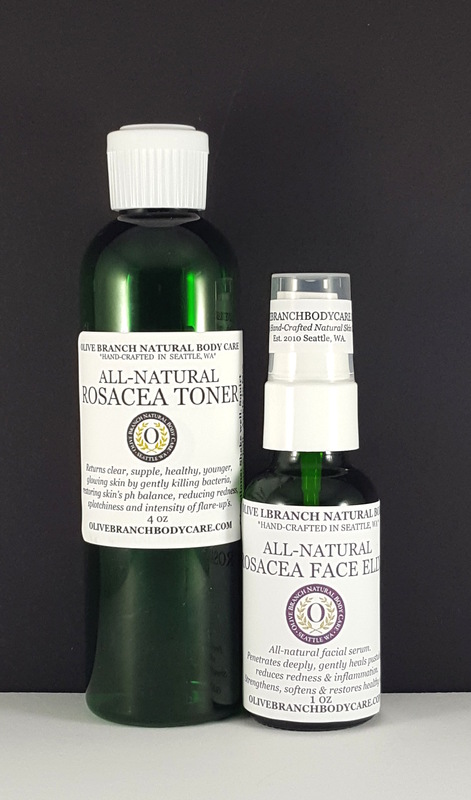 Essential oils to help reduce inflammation and heal skin with Rosacea: organic seabuckthorn fruit oil, lavender, cypress, roman chamomile, helichrysum, neroli, rosewood, tea tree, rose absolute, rose geranium and frankincense frereana. All-natural preservative: made from radish root, honeysuckle & aspen bark. Ingredients: (organic) simmondsia shinensis (jojoba) seed oil, (organic) Borago Officinalis (Borage) Seed Oil, Oenothera Biennis (Evening Primrose) Oil, (organic) Rosa Canina (Rose hip) seed oil, Hippophae Rhamnoides Oil (Sea Buckthorn Fruit), (organic) Cucumis Sativus (Cucumber) Seed Oil, (all-natural preservative:leuconostoc/radish root ferment filtrate, lonicera japonica (honey-suckle) flower extract, lonicera caprifolium (honeysuckle) extract, populus tremuloides bark extract, glucono-lactone), tocopherol (natural vitamin e), vegetable glycerin, Helianthus Annuus (Sunflower) Seed Oil and Lupinus Albus Seed Extract, Lavandula Angustifolia (Bulgarian Lavender) Oil, Cupressus Sempervirens Leaf (Cypress) Oil, Anthemis nobilis (Roman Chamomile) Oil, Helichrysum Angustifolium Flower Oil, Citrus Aurantium Dulcis (Orange) Neroli Flower Oil, Aniba rosaedora (Rosewood) Oil, Melaleuca Alternafolia (Tea Tree) Leaf Oil, Rosa Centifolia Flower Extract (Rose Absolute), Pelargonium Graveolens (Rose Geranium) Oil, Boswellia Frereana Resin (Frankincense) Oil. 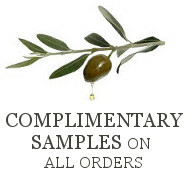 Olive Branch products are handmade from the finest natural ingredients, free of parabens, dyes, petroleum, alcohol, artificial fragrances and artificial flavors.